Elliebelly Knit & Dye Works > Blog > Knitting > What Did You Knit This Year? What Did You Knit This Year? This is my knitting year in review, or at least most of it. 2014 was a really good year for knitting in my house, likely because our Iceland trip spawned the need for lots of warm things early on and once my hat and cowl mojo got into gear, it never left me. It was also the year I conquered lace, starting with Pale Pink Shells, knit during the Olympics, and continuing onto Rainbow Fish and Lida. I started Lida during a trip to South Carolina in May and didn't finish her until September. She became my constant companion, knitting a row here and there in the carpool line or the doctor's office, and I love wearing her as much as I loved knitting her. I also knit a Citron, the oldest unknit pattern in my queue, from my favorite yarn of all time, Elliebelly Moth and Goat, a silk/cashmere blend that I dyed into a sunshine-y color, just when I needed some sunshine in my life. Speaking of favorite yarns, late in the year I discovered The Plucky Knitter's yarns and fell in love. Some people got up early to shop on Black Friday. I sat in front of my computer and bought Plucky. Lots of it. My first project was a Nevermind hat in the Plucky bulky cashmere blend called Snug. My second project, which I only speak of with great difficulty, was a pair of beautiful merino mitts that were almost done when I stupidly left them in the Atlanta airport, never to be seen again. I've got an Olivia shawl in the works in a worsted Plucky yarn and plan to cast on several more projects this week to get me through January and February in Plucky yarn. Because I am in love. Plucky has great yarn, beautiful colors and the most incredible customer service. 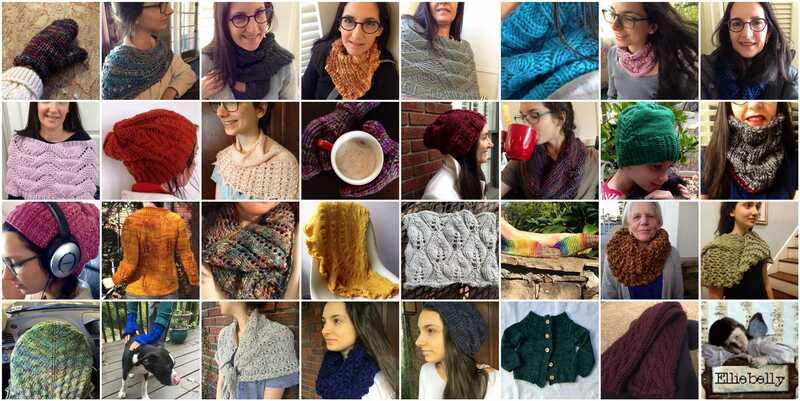 2014 has been a great knitting year. Looking at my collage, I've decided I need to up my photography game in 2015, so my poor knitting models darling children can all have that to look forward to. 2015 will be a year filled with cashmere, sweaters, happy knitting, and it will, of course, be the year I start my Christmas knitting early. I'm starting in January this year. Really. I think your photos look great; and, the models are certainly very good looking! Happy New Year. I look forward to seeing your projects. Thank you. The models are lovely arent they? Its just the photographer who is wonky.